Aurora kinase inhibitor III is a potent inhibitor of Aurora A kinase (IC50 = 42 nM). Cenisertib selectively binds to and inhibits aurora kinases (AKs), a family of serine-threonine kinases which are important regulators of cell division and proliferation, and which are overexpressed in certain types of cancer. CCT241736 is a novel, orally bioavailable, imidazo[4,5-b]pyridine derivative discovered at our Institute, highly selective for FLT3 and Aurora kinases with an S(10) selectivity score using KINOMEscan™ technology of 0.057 (fraction of 386 non-mutant kinases inhibited >90% when screened at 1 uM of CCT241736; San Diego, CA). AT9283 is a multi-targeted inhibitor with IC50s of 1.2 nM, 1.1 nM for JAK2 and JAK3, respectively, and is also potent to Aurora A, Aurora B and Abl(T315I). 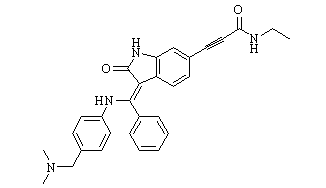 BI-847325 is an ATP competitive dual inhibitor of MEK and aurora kinases (AK) with IC50 values of 4 and 15 nM for human MEK2 and AK-C, respectively. XL228 is a protein kinase inhibitor targeting IGF1R, the AURORA kinases, FGFR1-3, ABL and SRC family kinases. ENMD-2076 has selective activity against Aurora A and Flt3 with IC50 of 14 nM and 1.86 nM, 25-fold selective for Aurora A than over Aurora B and less potent to VEGFR2/KDR and VEGFR3, FGFR1 and FGFR2 and PDGFRα. 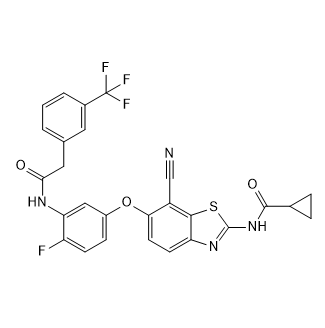 ENMD-2076 Tartrate is a multi-targeted kinase inhibitor with IC50s of 1.86, 14, 58.2, 15.9, 92.7, 70.8, 56.4 nM for Aurora A, Flt3, KDR/VEGFR2, Flt4/VEGFR3, FGFR1, FGFR2, Src, PDGFRα, respectively. 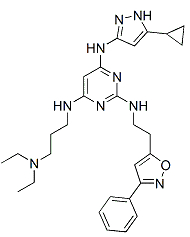 TAK-632 is a potent pan-RAF inhibitor with IC50 of 1.4, 2.4 and 8.3 nM for CRAF, BRAFV600E, BRAFWT, respectively.